Kanteen Launches Meat Me at the Sea Burger. Kanteen restaurant is located in the modern K West Hotel, situated in Shepherds Bush and in close proximity of Westfield shopping centre. The restaurant is on a mezzanine level, just above the bar area. The layout is bright and colourful and the walls are adorned with some contemporary artworks which are also available to buy. I understand that the place can get pretty buzzy of an evening but we didn’t see much evidence of this when we arrived for a late Saturday lunch. In fact, we pretty much had the place to ourselves but this did mean that we had the undivided attention of the glamorous and very attentive waiting staff. Head Chef, Eduart Berisha, is in charge of the menu and his latest creation is the ‘Meat Me at the Sea Burger’. 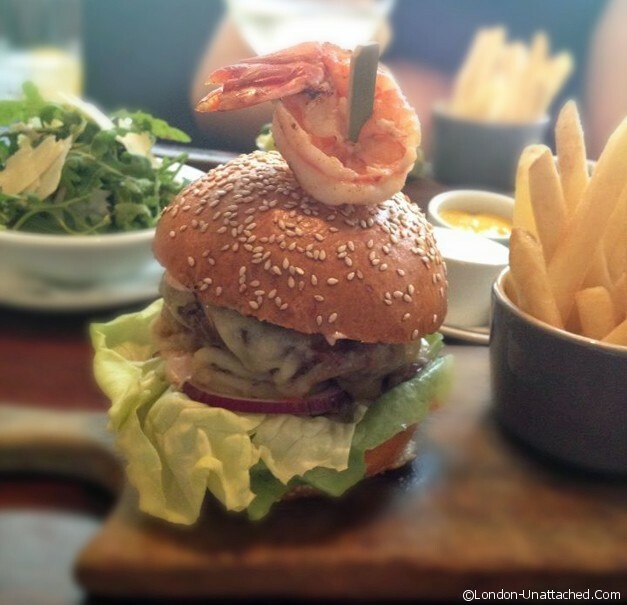 Priced at £16.50 with fries, this is Surf ‘n’ Turf in a bun. The restaurant has an extensive burger menu and they are all topped with melted cheese, red onion and the Chef’s Long Island sauce (pretty much thousand island sauce) but this particular burger includes grilled squid and is topped with a large tiger prawn. If, like me, you are a fan of seafood, then this is a good choice. The squid was very tender and the sweetness of the prawn was a nice accompaniment to the beef patty. But if you fancy it, you need to be quick, as this burger will only be on the menu from now until the end of October. If you are not a burger person, there are also a small selection of dishes from the grill, salads and pasta. We also sampled a couple of the starters. The Zucchini flowers, stuffed with goats cheese, came still attached to the courgette and were coated in a batter and fried. Somewhat surprisingly, they were extremely sweet and tasted as if they had been sprinkled with sugar. When I asked the waitress about this, she said it was due to the honey glaze they were coated in. I would, therefore, say these are only for those who have a particularly sweet tooth. 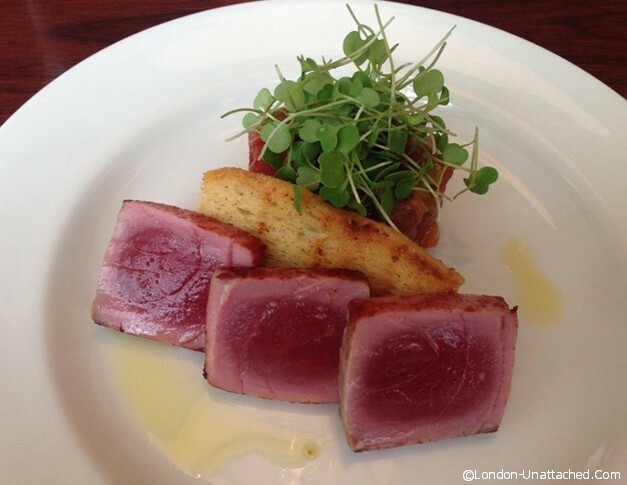 We also tried the Yellow Fin seared tuna which came in three generous slices. This was accompanied by a caponata and focaccia crostini. Again, the caponata was rather on the sweet side. Desserts are simple favourites done well. 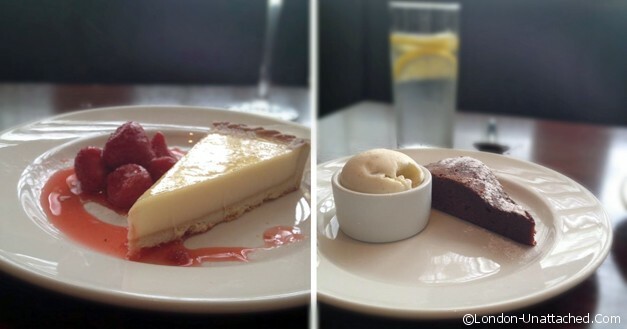 We tried the lemon tart and warm chocolate brownie with ice cream. This was a little decadent after all that had come before but they slipped down very nicely with another glass of Savignon Blanc! The restaurant is open all day and so they staff are in no rush to see you leave and you are made to feel very welcome. This is so beautifully presented. It seems like both trendy and classic taste. Fun! what a great place for a casual but tasty meal. I love that you got to experience on a day when they weren’t terribly busy!